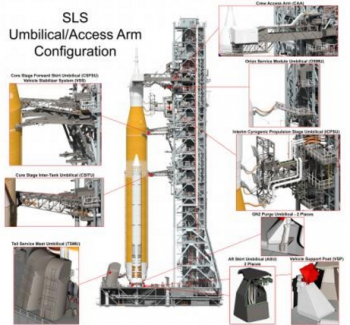 As part of its transition to the powerful Block 1B variant of the Space Launch System (SLS) with the Exploration Upper Stage (EUS), NASA is working on a device called the Universal Stage Adaptor (USA). This adaptor will help connect the large EUS to the Orion spacecraft while accommodating the massive payloads SLS is intended to carry to destinations beyond Low Earth Orbit. In its initial Block 1 configuration, SLS will be outfitted with the Interim Cryogenic Propulsion Stage (ICPS) — the same second stage currently used on United Launch Alliance’s Delta IV rocket family. As such, the rocket’s initial build will focus on how the ICPS connects to the MPCV — with all structural elements in that area of the vehicle designed for the ICPS. However, the SLS EM-1 mission is the only flight on which the ICPS will fly, with SLS itself transitioning to its Block 1B configuration with the much more powerful EUS replacing the ICPS. Thus, the connecting structure built for ICPS to Orion (MPCV) will not work for Block 1B. Enter the Universal Stage Adaptor (USA), which will debut on SLS during the EM-2 mission. 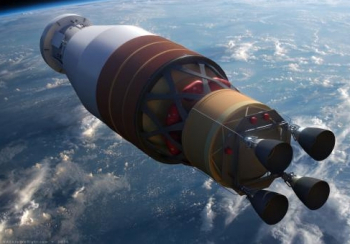 The goal of the USA is to provide the hardware that would allow the more powerful Block 1B SLS to utilize her upmass ability by launching co-manifested payloads, along with – for instance – the Orion spacecraft. Technically, SLS Block 1B would be able to loft an Orion, on top of the rocket, along with a module, hab – or a different major hardware element – during the same launch. “The Block 1B configuration will provide up to 5 times a greater mass to orbit capability than non-SLS launch vehicles, and a much larger payload volume than the current launch systems,” as cited in the latest SLS ConOps for the Block 1B SLS, available in L2. For the SLS Block 1B mission profiles, SLS would first ascend to the Orion spacecraft separation point, before the EUS gets into position to jettison the upper portion of the USA in order to provide access for co-manifested and Secondary Payload deployment. NASA has already begun the process of soliciting industry input on a request for proposals for contracts to build the USA. 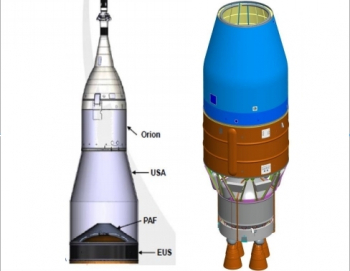 The USA will be more than just an adaptor, as it will provide environmental control to payloads during integrated ground operations, launch, and ascent phases; separate to expose payloads post Orion deployment; and transfer any services between PAF (Payload Attach Fitting)/EUS and Orion – as described by NASA. Additionally, the USA must also provide processing access to co-manifested payloads after encapsulation. Along with the conceptual design elements of the USA, NASA also identified a total of seven key requirements for the USA, including, above all, the assurance of crew safety in all phases of flight while still meeting general SLS Block 1B system requirement performances and overall mission objectives. Moreover, the USA must fully conform to SLS, MPCV, and Ground Operations systems while at the same time optimizing total liftoff weight of the vehicle and meeting all upper stage mass targets. The USA must also be able to “Reliably separate without damaging or re-contacting the EUS, Co-Manifested Payload, or MPCV,” noted a solicitation presentation. Another element of the USA is that it must also provide a pathway for electrical and communication relays between the EUS and the MPCV. This relay will allow power, command, data transfer, communication and ground path between SLS and the MPCV; thus the USA must provide “adequate wiring support and separation disconnects without excessive structural point loads”. 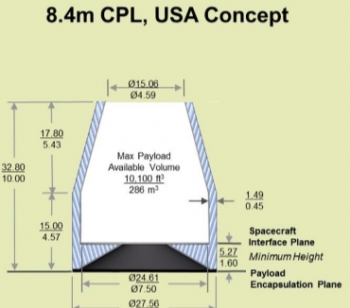 Finally, the USA must provide environmental, thermal, acoustic and pressure protection for all co-manifested payloads under its protection during encapsulation, stacking, rollout, pad ops, and launch. In terms of thermal control, the USA will have to provide temperature control at the pad as well as protection from external ascent aerodynamic heating, on-orbit radiative heating, and trans-lunar injection heating. Acoustic protection considerations involve the liftoff environment with four RS-25s and two SRBs as well as transonic environment concerns with pressure waves, shock waves, and buffeting. 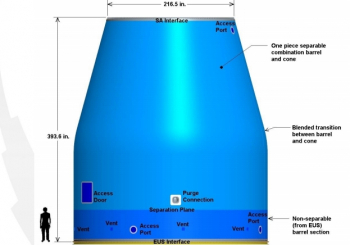 Overall, the USA will measure 5.5 m in diameter at the top where it attaches to the Spacecraft Adapter (SA), have a total height of 10 m, and a base diameter – where it connects to the EUS – of 8.4 m.
Moreover, the USA must be a “one piece separable combination barrel and cone” with a blended transition between the barrel and cone and carry a designed separation plane 1.7 m above the EUS interface — meaning that a portion of the USA will remain attached to the EUS upon separation. With all of these requirements, Systems Engineering has provided a clause that the contractor chosen to develop and build the USA will “develop a Contract End-Item (CEI) Specification based on the USA Requirements Document”. These CEIs include all interface requirements of the USA with the Mobile Launcher as well as all critical external interfaces the USA will have with the MCPV SA, PAF/EUS, and GSDO. The contractor, as is standard, will perform all qualification tests, to be followed by NASA acceptance testing with mandatory “Verification and test plans … to address how the system will be qualified for human-rated flight”. Moreover, the contractor eventually selected will have to build the USA so that it is “space flight qualified through the life of the design, including the ability to reconfigure access doors and other intrusions to mission specific requirements”. This reconfigurable, flexible design will have to meet all “requirements and margins without altering the primary load path while eliminating the need for requalification,” notes the solicitation presentation. 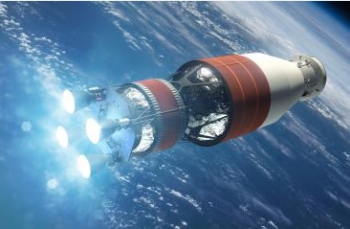 Overall, a reconfigurable design for access will help NASA meet its co-manifested payload goal for SLS – most of which will not be defined as each USA enters its build and all of which will have varying needs in terms of access and work following encapsulation. Under a notional one year plan, NASA released a draft Request For Proposals (RFP) for the USA to contractors on 1 August 2016 before meeting with all interested parties for technical overviews, Q&As, and one-on-one discussions at an Industry Day event on 17 August. Based on that Industry Day and the questions received, NASA accepted feedback and comments on the draft RFP through 31 August, at which point the agency began a review of those comments with an eye toward refining the RFP. 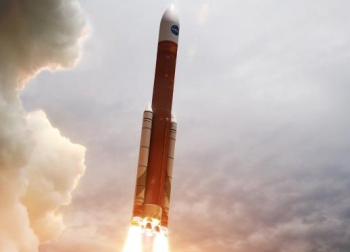 NASA is scheduled to release the final RFP on 3 October, at which point companies will have until 18 November to meet the Volume II early submittal deadline before their final proposals are due by 2 December. At this point, NASA will embark on a nine month process of reviewing the proposals with the final contract award for the USA expected on 1 August 2017. This will allow plenty of time to prepare the path for the debut of the USA for the EM-2 mission in the early 2020s. Once the contract is awarded, current “notional EM-2 development schedules” show that the company will have from August 2017 to January 2018 to create a preliminary design for the USA – at which point it will go through its Preliminary Design Review (PDR). The Critical Design Review (CDR) will then follow in January 2019, two months after the contractor begins building the Qualification Test Article (QAT) of the USA. The USA QAT build would – under this notional schedule – begin in November 2018 and finish in March 2020 with final qualification testing. At the completion of USA QAT build and testing, the Design Certification Review will then clear the contractor to proceed forward with the build of the flight unit USA for EM-2. Flight unit build is then slate to last from March 2020 to February 2021 – at which point the USA will be delivered to the Kennedy Space Center. 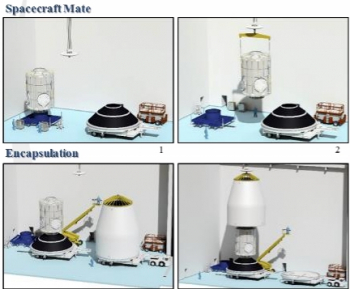 KSC will be where the co-manifested payloads – shown in one presentation to be a hab module – to be processed ahead of mating with the SLS in the Vehicle Assembly Building (VAB). The USA will the undergo final preparations for EM-2 – which according to this notional schedule is slated for the mid-fourth quarter of Fiscal Year 2021 (~ August 2021). However, internal schedules and protections show SLS EM-2 isn’t expected to take place until 2022 or 2023.